In this video we will discuss passing parameters to routes in Angular. This is continuation to Part 30. Please watch Part 30 from Angular 2 tutorial before proceeding. Let us understand this with an example. 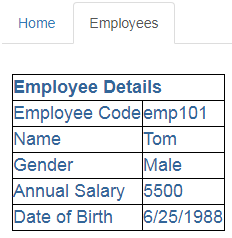 We want to make Employee Code on Employee List component clickable. When we click on an Employee code, we want to redirect the user to Employee Component which displays that specific employee details. In the URL we will pass the emploee code as a parameter. So clicking on EMP101 will redirect the user to URL (http://localhost/employees/emp101). The Employee component will then read the parameter value from the URL and retrieves that specific employee details by calling the server side web service. In our previous video we have modified the code in app.module.ts file to use hash style routing. Let's remove useHash property, so we are using HTML5 style routing instead of hash style routing. Notice from the forRoot() method I have removed useHash property. For HTML5 routing to work correctly, uncomment the following URL rewrite rule in web.config file of our Angular application. In the root application module (app.module.ts), include the following route. 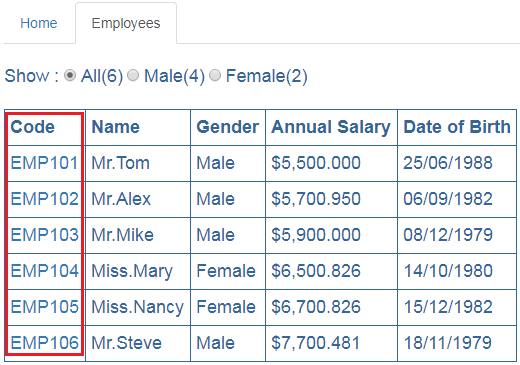 When the user navigates to a URL like (http://localhost:12345/employees/EMP101), we want to display EmployeeComponent. Notice the code parameter specified using colon (:). Include the above route in appRoutes collection in app.module.ts file as shown below. Remember the order of the routes matter. Next, in EmployeeListComponent, modify the <td> element that displays employee code to bind it to the route we created above using the routerLink directive as shown below. Notice in this example we are binding routerLink directive to an array. This array is called link parameters array. The first element in the array is the path of the route to the destination component. The second element in the array is the route parameter, in our case the employee code. In the Angular EmployeeService (employee.service.ts), introduce the following getEmployeeByCode() method. This method takes employee code as a parameter and returns that employee object (IEmployee). This method issues a GET request to the Web API service. Once the Web API service returns the employee object, this method maps it to IEmployee type and returns it. To retrieve employee details by calling the Angular EmployeeService method getEmployeeByCode() we created above. This method calls the server side Web API service which retrieves that specific employee details from the database. There are different approaches to retrieve route parameters values. We will discuss all the different approaches and when to use what in our upcoming videos. Since we need EmployeeService both in EmployeeListComponent and EmployeeComponent, let's register it in the root module so we get a singleton instead of multiple instances of the service. Thans a lot for providing this tutorial videos. I think I was getting this also earlier. You may try to use same port number as the webApi service. After registering service in root module , I amgetting error ERROR Error: Uncaught (in promise): Error: No provider for Employeeservice"
I got the similar error. I solved it by importing "employeeservice" to app.module.ts.